Yikes! There's a pimple on your chin! What should you do? Pop it? Tempting huh? But noooooooo~! Popping pimples actually pushes the infection further into your skin, causing more redness, swelling and scarring (more prone to indented scars). Instead of popping the pimple, apply spot treatment formulated with active acne ingredient on the zit and let it dry naturally by itself. If you pop a pimple by accident, I recommend to stick a Nexcare Acne Patch over the zit. This acne patch helps to absorb all the pus embedded in the pimple, without needing to squeeze with your fingers, thereby reducing the damage done to your skin. Cleansing your face several times a day does not cure your acne. In fact, you are ruining your skin and inviting acne. When you over-cleanse your skin, you are over-stripping away the skin oil that acts as a function to keep skin moisturized and balanced. Deep down, your skin naturally pumps out oil to the surface to keep it moisturized so if your skin is too dry, it will produce even more oil to compensate for the dryness. This could lead to excess oil production, causing more congestion along with possibly dryness and irritation. So now you know each time you cleanse your face, you are not only removing excess sebum, but also stripping skin of its natural oils hence, we need moisturizer to replenish the loss. Wash your face twice a day is sufficient. Don't forget to apply moisturizer afterwards. Use a cleanser and moisturizer that is made specifically for acne skin. These usually contain active acne ingredients like salicylic acid, benzoyl peroxide or tea tree oil. Remember that a well-hydrated skin helps to slow down the rate of oil production. Yes, buffing away dead skin cells is beneficial to the skin. It helps to prevent clogged pores, keeping pimples from forming. It is okay to exfoliate if you have very mild acne issues (non-inflamed whiteheads, flesh color bumps or blackheads). But it is not okay to exfoliate if your skin is flooded with red, inflamed pimples as it may further aggravate them and make them worse. It's best to avoid exfoliating your skin if you have lots of inflamed pimples. As I've said, it may further aggravate them. Well, I do agree that itching is a sign of healing, but this applies to an injury, a wound. This does not apply to facial skin. Itching is certainly NOT a sign that your acne is healing! When your facial skin itches, it is an indication that your skin is dry. It can also be a sign of skin allergy/irritation. Therefore, do not ignore the itching issues! Take action quickly, otherwise your acne may get worse. All you have to do is to moisturize your skin! Once your skin is well hydrated, the itching sensation will stop. If the itching is caused by an allergic reaction with visible redness, you have to find out what causes it and stop using that product immediately. 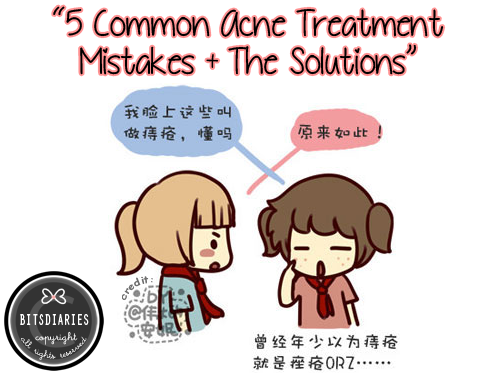 "Bear in mind that treating acne doesn't need aggressive treatments.